Type in a name and click the Add Organization button. You can now access your new organization from the Admin homepage. To access the users handing page, click the Users link in the company drop-down menu (left sidebar). Can only view and collaborate on content as it is shared by existing members. While in the users landing page, click the + taskbar icon. Enter your new user's information as prompted and click Add User . 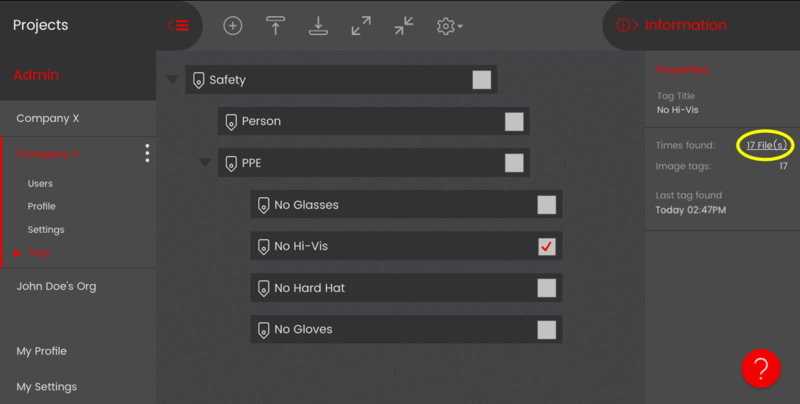 Edit any of these fields and click the Update User button to save changes. Appears in the header bar, on projects, in the media reviewer, and on all shared links. 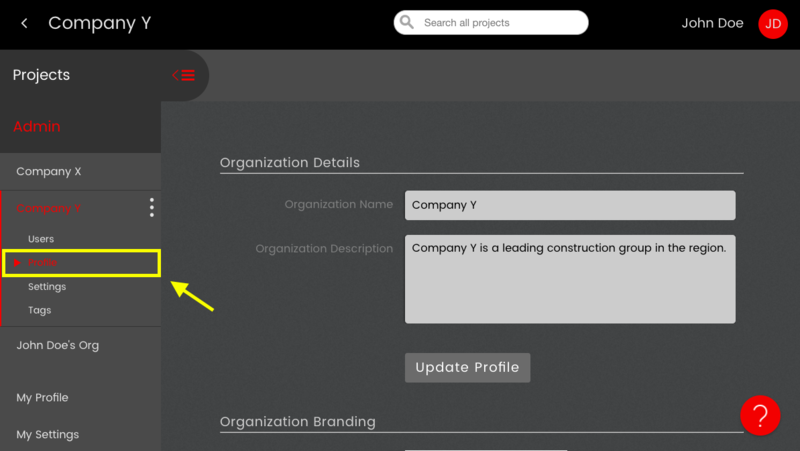 Under Organization Details, type edits in the Organization Name and Organization Description fields. Click Update Profile button to save changes. Thumbnail & logo images should have an approximate size ratio of 1.5:1 (width:height). This is the picture used for the organization's thumbnail on the Admin homepage. Under Organization Thumbnail' and Organization Logo, click the Browse buttons to upload images from your computer, or click Clear to remove previously uploaded photos. Click the Update Profile button to save changes. 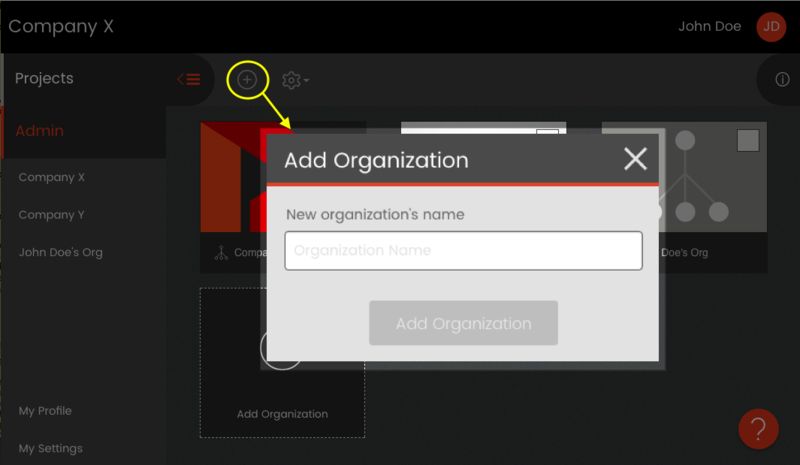 Owners & Org Admins can use the Settings page to manage an organization's registration & sharing settings. 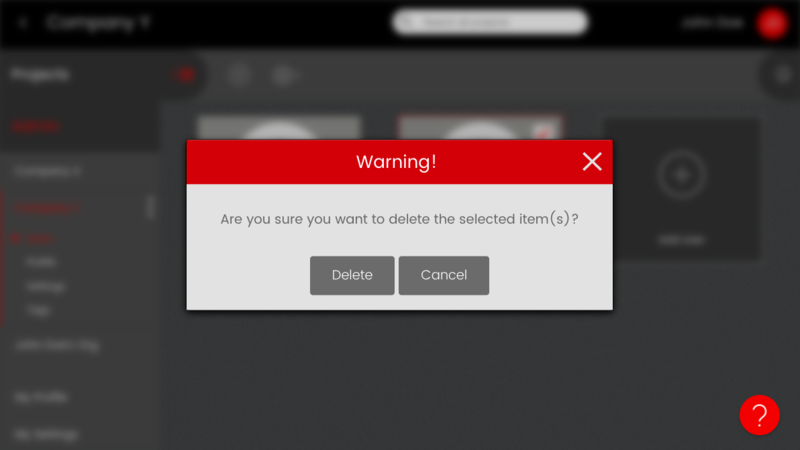 Under this mode, new users will only be able to join the organization if an existing user adds them or shares with them a link to view tags, searches or files. Select By invitation or request only. Leave the 'Enter comma separated email domains' field empty. By invitation or request Under this mode, new users can join the organization by a) being invited or b) asking to join when they register with an email belonging to specified domains. An organization admin will need to approve join requests. 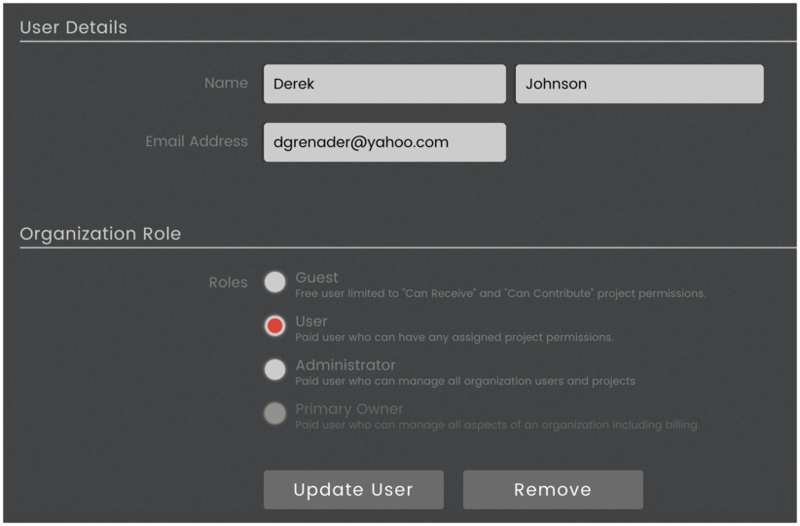 Under this mode, new users will be able to join an organization by a) being invited, or b) registering with an email address from a specified domain. For example: if you choose this and save ABCcompany.org as an allowed domain, users that sign up with an @ABCCompany.com email address will automatically get access to the organization. Select By joining with any email address from one of these domains. Enter allowed domain(s) in the text area. Separate multiple domains with commas, e.g. democompany1.com, democompany2.com,democompany3.com. Note: You cannot enter public domains (outlook.com, gmail.com, etc). Click the Update Settings button to save your changes. 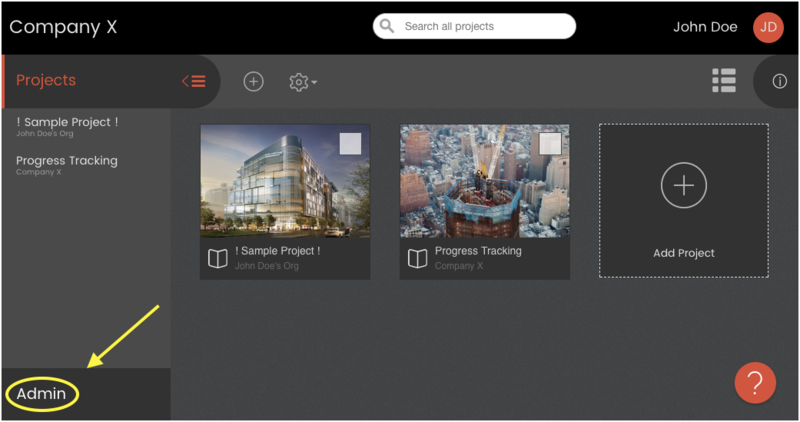 You can optionally turn on public link sharing, used when users in your organization share searches, tags or files. 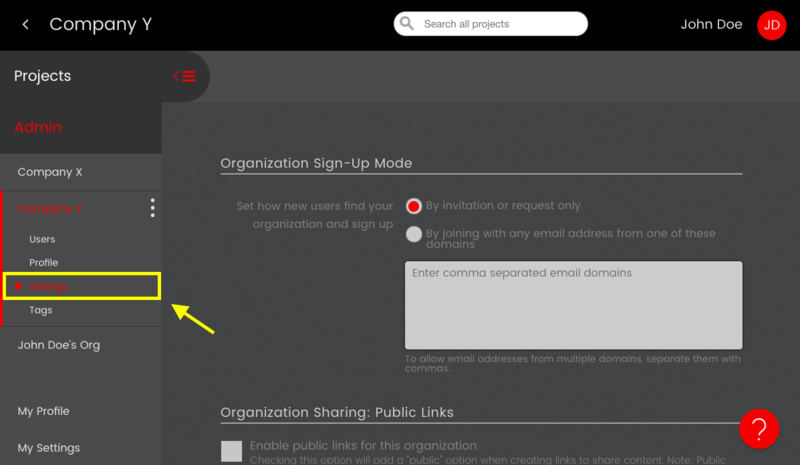 Click the check box to turn on public link sharing for all projects in the organization. 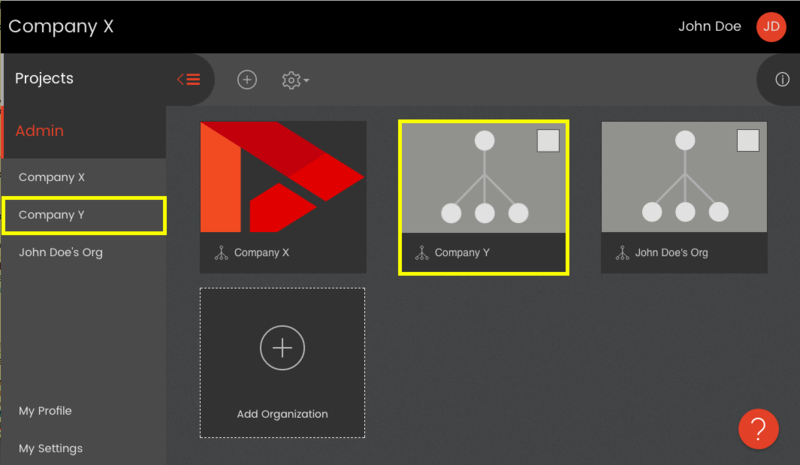 Organization tags let you establish a standard set of tags for use across your company. 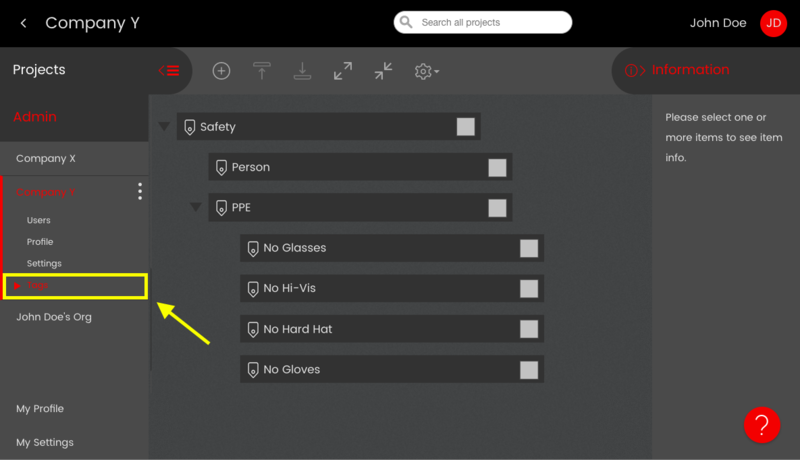 Any tag definitions created here will be in the Tags view of all projects in the organization, and project members will not be able to edit, move or delete the tags.